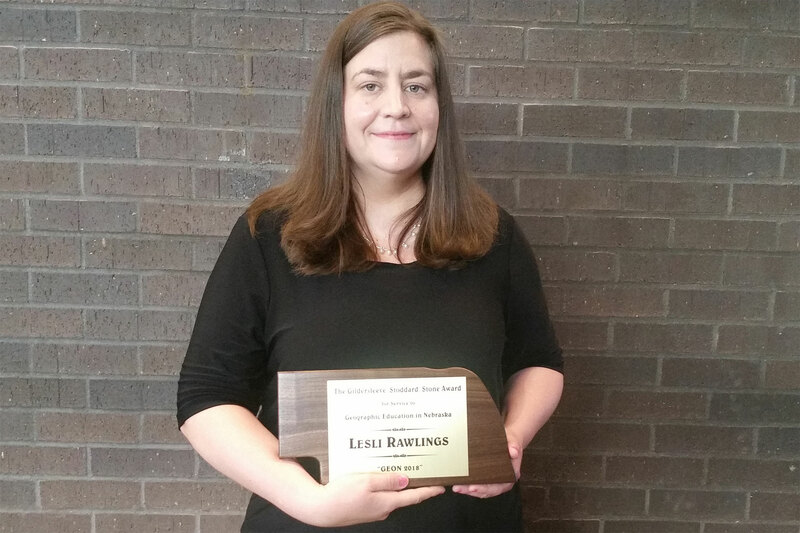 Dr. Lesli Rawlings, associate professor of geography at Wayne State College, received the annual Gildersleeve-Stoddard-Stone Service to Geography Education Award from the 3rd Congressional District in Nebraska in May. She was nominated by her colleague, Dr. Randy Bertolas, professor of geography and Alliance Coordinator of the Geographic Educators of Nebraska (GEON). The award is the highest recognition given in the GEON organization. One educator in each of Nebraska’s three Congressional Districts receives this award for advancing and improving geographic education in the state. The award ceremony was held at the Nebraska History Museum in Lincoln on May 31. Gildersleeve passed away in October 2009. Rawlings teaches geography and geospatial technology courses at Wayne State College and is the co-advisor for the geography honor society Gamma Theta Upsilon. In addition to teaching, she maintains an active service agenda. As a member on the Nebraska Geographic Information Systems (GIS) Council, Rawlings serves as a liaison between the council and GEON. She has trained Nebraska K-12 teachers at summer workshops on how to integrate GIS into their curriculum. Under her guidance, WSC students have completed service-learning projects using geospatial technology. One project had students create an interactive map of historic buildings and artwork in Wayne. In another project her students assisted St. Mary’s fourth, fifth, and sixth graders to learn GPS technology through geocaching, a project that met the Nebraska Social Studies Standards involving absolute/relative locations, navigation, and direction.